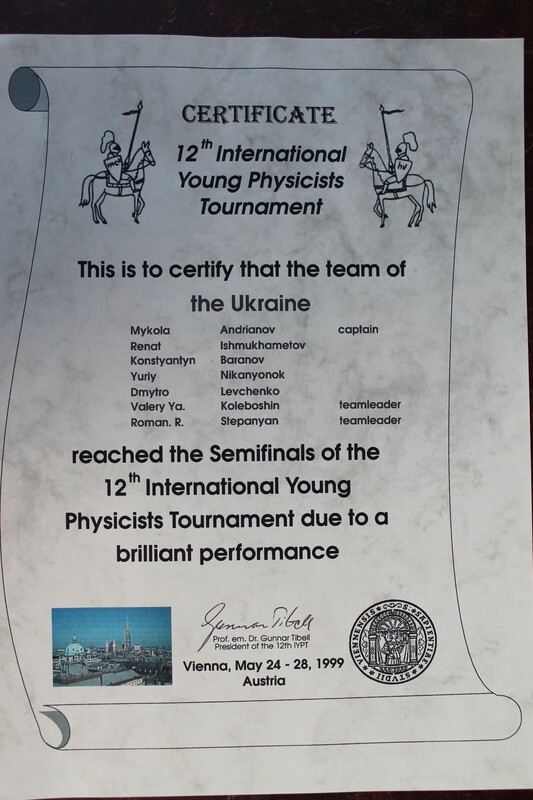 Roman Stepanyan, Ukrainian team member and team leader at several IYPTs since 1993, comes back with substantial feedback about the early IYPTs, new details, and important corrections for the IYPT Archive. Roman Stepanyan earned a PhD from the Rijksuniversiteit Groningen and is currently a researcher at DSM Ahead in Geleen, Netherlands, focusing on the rheology of complex fluids. In your list, Dimitry Galayko is absent, which is the main reason I am writing this e-mail: he was one of the key players and certainly deserves to be mentioned. If necessary, you can contact him personally. The problem reported by us in the final (Ukrainian team) was “Recharge” where we were given a charged capacitor and had to transfer its charge (as much as possible) to another capacitor. It was reported by Dimitry Galayko with Georgian team as opponent. We were opponents of the Hungarian team. I was representing the opposition. The Georgian team was reporting “Domino”, opposed by Georgians. Our team was represented by A. Morozov. So, some statements about the teams in your paper are not quite right. tournament but I do not recall the details. I. M. Many thanks again for your kind and so helpful input. If possible, can I please check with you the names of the Ukrainian team members and leaders at the IYPTs that you attended either as a leader or as a member? R. S. I’ve put the info I remember below. [...] I also asked Vladimir Kulinskii about the names, etc. 1992 : Alexander Morozov, Igor Zozulya, Valentin Topelkin; this is all available data about the team. > Leader Igor Altman, Zozulya was the captain. 1994 : I don’t have any data on the Ukrainian team, but Vladimir Kulinskii was probably the leader or one of the two leaders. 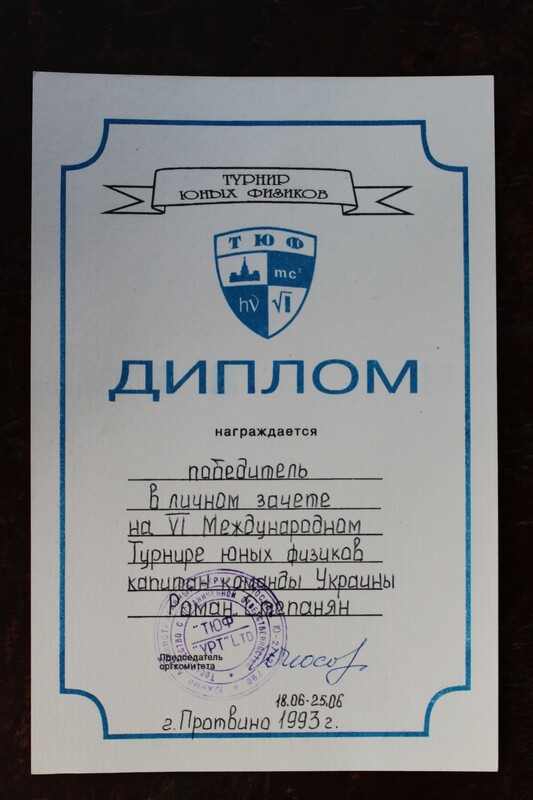 > The names of the 1994th Ukrainian team (also present at 1993th YPT as Ukraine-Odessa) as I’ve got them from Kulinskii: Sergey Koleboshin, Vladimir Tolpekin, Igor Orlovich, Dimitri Popov, Andrey Lugunov. Leader: Vladimir Kulinskii. 1997 : Kirill Belokurov, Igor Vorokhaev, Grigoriy Zavorothny, Denis Murakhovskiy, Elisaveta Ovdeenko as team members; no direct data on the team leaders. > Pavel Viktor was the leader. Vorokhaev was the captain, I guess. I. M. Thank you. I will make all these corrections at archive.iypt.org and in my preprints. If you do not have objections, I will also bring your commentaries into a short news release, so that we have a public primary source for these essential updates and corrections. R. S. I do not have any objections. [...] Your archive looks really impressive! 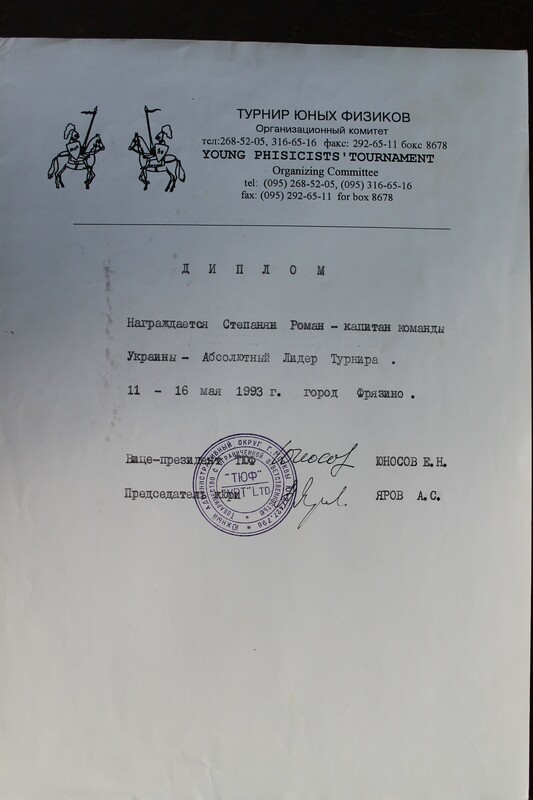 UPD R. S. I found some diplomas from Fryazino, Protvino and Vienna. 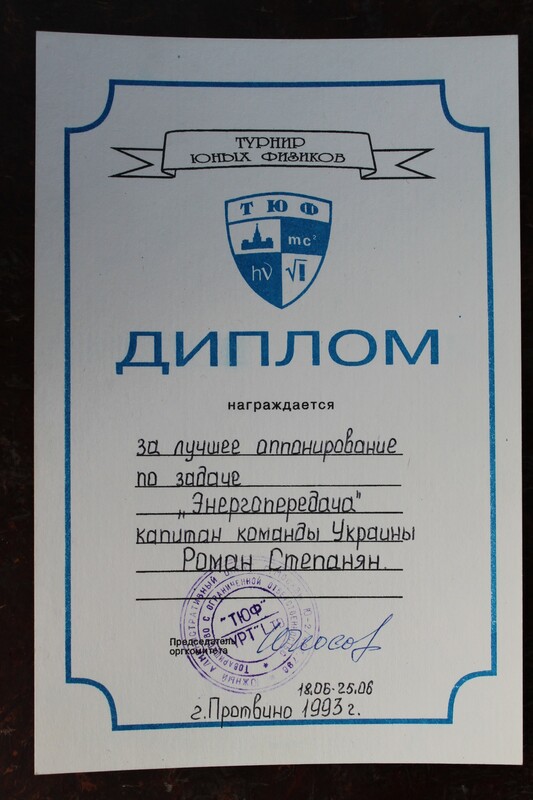 It’s a pity I don’t have our team’s diplomas from Fryazino and Protvino, only the personal ones. The discussion and fact checking held between December 7 and December 15, 2011. Updated with documents, corrected on August 27, 2012.